Precision Wound Filter Cartridges - D. I. 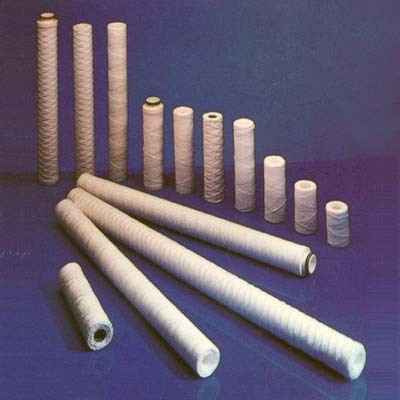 Engineering Co. Ltd.
Texflow precision wound depth filter cartridges are manufactured to give a considerable dirt holding capacity coupled with high flow rates and low pressure drop. Texflow elements can, under certain conditions, be back-washed, but are generally treated as "disposable" elements. Texflow elements are manufactured to ISO 9002 quality standards in our modern, purpose built, factory. This ensures reproducibility of product, first calss performance and competitive pricing. Texflow elements consist of a perforated support core of plastic or metal onto which yarn is wound at a pre-set rate, providing each rating of element with its own distinctive winding pattern and performance. During the winding process the yarn is usually brushed (or napped). This has the effect of increasing the working area of the elements thus providing a higher dirt holding capacity whilst maintaining the rigid structure.